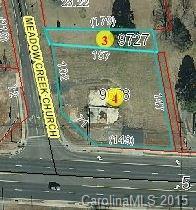 DESIRABLE LOCATION - CORNER WEST MAIN STREET AND MEADOW CREEK CHURCH ROAD. LOCATE YOUR BUSINESS HERE---Hard corner with over 22 +/- traffic count per day. Leaving Locust side of street. We invite you to come look at this property and begin the process of locating your business in the fast growing city of Locust. Motivated seller ready for your offer. Seller will consider land lease also.